This 60-Minutes PG-13 comedy bus tour is fun and interactive for all alike. No need to worry, the language is a little more tame with a little more comedy. You will travel through streets of Charlotte NC and the surrounding historical neighborhoods. 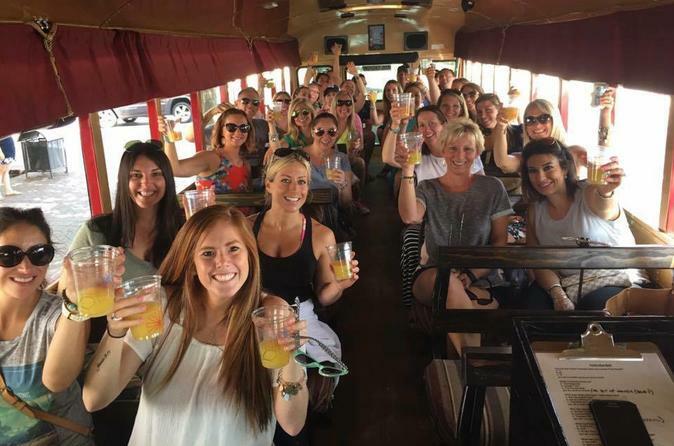 Guests are permitted to bring their own beer and wine on the bus, but there is No hard liquor or food allowed. The bus is for loud and excited guests who have a good sense of humor. Our professional Guides provide humorous commentary on the sights, sounds, and history. They will keep you entertained as you travel through the Queen City and pass by local sights. Come LAUGH AND LEARN with us! Your PG-13 comedy tour departs at FIRST WARD PARK (301 E 7th St) by the Google Building and the Rail Road stop. Cross Road is College and 7th and will begin in Uptown, where you'll board the open-air bus and meet your comedic guide. Cruise along the streets to take in the sights and atmosphere as your guide humorously highlights the history, architecture, and entertainment of the city. As you travel through some of Charlotte's most interesting neighborhoods, including Uptown, Southend, Plaza Midwood, NoDa, and the Fourth Ward, listen as your tour guide puts a comedic spin on the sights, sounds and history of Charlotte. About halfway through, you'll stop for a quick break. Feel free to bring your own beer and wine on board to enhance your experience. Please note: Due to the nature of the jokes on the bus, this tour is intended for passengers 13 years of age and older. Those under the age of 13 are not permitted, and absolutely no babies are allowed on the bus due to safety issues (there are no seat belts, and the bus cannot hold car seats or strollers).